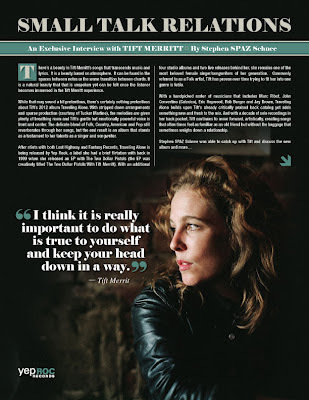 Discussions Magazine Music Blog: An EXCLUSIVE Interview with TIFT MERRITT! 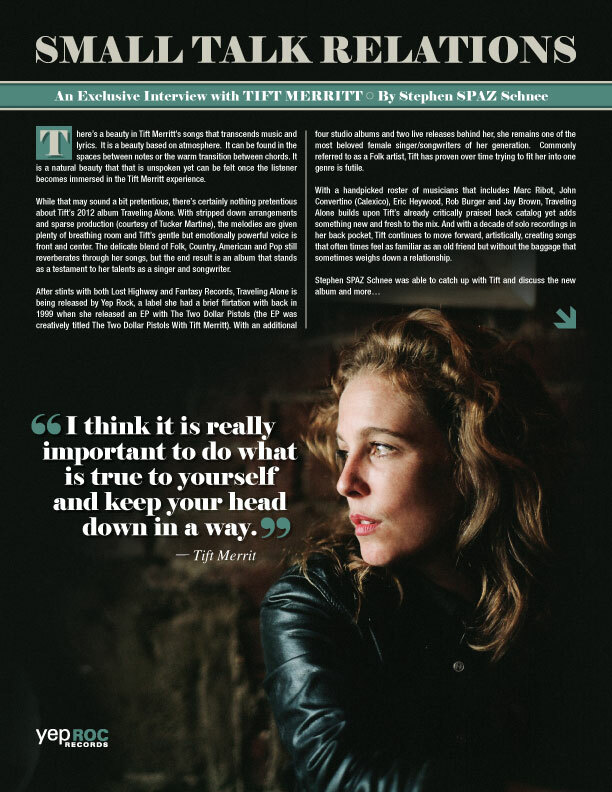 An EXCLUSIVE Interview with TIFT MERRITT! There’s a beauty in Tift Merritt’s songs that transcends music and lyrics. It is a beauty based on atmosphere. It can be found in the spaces between notes or the warm transition between chords. It is a natural beauty that that is unspoken yet can be felt once the listener becomes immersed in the Tift Merritt experience. 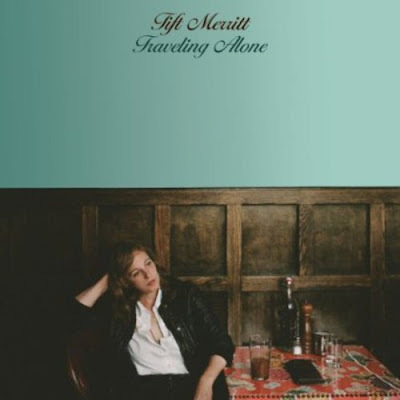 While that may sound a bit pretentious, there’s certainly nothing pretentious about Tift’s 2012 album Traveling Alone. With stripped down arrangements and sparse production (courtesy of Tucker Martine), the melodies are given plenty of breathing room and Tift’s gentle but emotionally powerful voice is front and center. The delicate blend of Folk, Country, American and Pop still reverberates through her songs, but the end result is an album that stands as a testament to her talents as a singer and songwriter. After stints with both Lost Highway and Fantasy Records, Traveling Alone is being released by Yep Rock, a label she had a brief flirtation with back in 1999 when she released an EP with The Two Dollar Pistols (the EP was creatively titled The Two Dollar Pistols With Tift Merritt). With an additional four studio albums and two live releases behind her, she remains one of the most beloved female singer/songwriters of her generation. Commonly referred to as a Folk artist, Tift has proven over time trying to fit her into one genre is futile. With a handpicked roster of musicians that includes Marc Ribot, John Convertino (Calexico), Eric Heywood, Rob Burger and Jay Brown, Traveling Alone builds upon Tift’s already critically praised back catalog yet adds something new and fresh to the mix. And with a decade of solo recordings in her back pocket, Tift continues to move forward, artistically, creating songs that often times feel as familiar as an old friend but without the baggage that sometimes weighs down a relationship. SPAZ: Your album Traveling Alone is about to drop. How are you feeling about this project and the reaction you’ve received so far? TIFT MERRITT: I've really really proud of this record. I guess you are always proud of your records, but this one feels especially good. It feels like we traveled a distance. SPAZ: The album is being issued a decade after your debut album was released. Do you feel that there has been a dramatic change within your profession during that time? TIFT: Lots of things have changed and lots of things have stayed the same. I've changed an enormous amount, and yet I'm very much the same person. Being a musician should always be about music and not much more complicated than that. SPAZ: When you began writing and recording Traveling Alone, did you have a distinct idea of which direction you wanted the album to go, or did the album come together organically? TIFT: Organically. Always. I think it is really a mistake to impose a direction on your work. You have to follow your work, rather than it following you. At a certain point, I wrote 'Traveling Alone' and I thought, "Oh that is what's happening here"…I remember having much the same feeling with the other albums too. TIFT: Well, joy and wonder with sadness and uncertainty is not a bad start! I wanted to ask the hard questions without any sense of pity in the asking. An eye on the hard edge of things without the luxury of feeling sorry for yourself. SPAZ: How did you come about gathering the musicians on the album? TIFT: We were very fortunate to have all of these amazing people in the same room. It began as a very natural conversation about who we wanted in the room. Whose aesthetic would fit. And also, we wanted a group of people who had not been in the room together 1000 times before so that it would be incidental and this would feel like another record in a series of records. Once we had a good idea, we just got really lucky that everyone was available and excited and game to do it. SPAZ: Tucker Martine produced the album. Was there a particular production of his that you heard that made you decide that you wanted to work with him? Or was he recommended to you? TIFT: Tucker worked with me on See You On The Moon and I have to say that Tucker has a tenderness about the way he works that I have never encountered before. He doesn't force things - he brings the best out in people. That is a wonderful thing to be around. SPAZ: The album has a much more stripped down sound to it. Was this a conscious decision when recording began? Do you feel that these particular songs benefit from being more direct and not over-produced? TIFT: Absolutely a conscious decision. I wanted to make a record live off the floor and not look back and sweeten it up. Being in the studio for a long time is a wonderful luxury and there is absolutely a time and place for that. But this was not that time. I wanted to take the risk of not hiding at all. What is interesting to me is a song and a performance that stands on its own and is comfortable with itself and is affecting without bells and whistles. I wanted to see if I could do that. SPAZ: Your voice and your songs are the album’s focal point, but did the other musicians offer any creative input into the sessions? TIFT: Of course! The musical and emotional give and take of the musicians on this record was absolutely key. And their sense of space and the kind of listening they lent these songs was how the whole process would work. Having that kind of musician in the room with you is a real gift. SPAZ: The folk and country elements of your sound are now more popular than ever. Do you feel that your music, as it grows and changes, is now more accessible and accepted than ever? TIFT: There are so many ups and downs and comes and goes in everything - I think it is really important to do what is true to yourself and keep your head down in a way. To build your own thing no matter what fireworks are going off or how many people are listening or what is trendy at any given moment. SPAZ: You started off your musical career in North Carolina, later moving to New York. Do you feel that the change of environment has had an effect on your writing? TIFT: I think where you are writing always has an affect on the writing. I really enjoy writing in a city because there is a sense of not being isolated and alone. You can always walk out your door and say hello to someone on the street or see other people living their lives. You can touch base easily with the comings and goings of quotidian life and I find that comforting. But there is always a lot of North Carolina in my writing and in my point of view. That is absolutely where I am coming from. TIFT: A lot of touring! SPAZ: What do you have currently spinning on your CD, DVD and record players? TIFT: Someone sent me a vinyl copy of 'Miles of Aisles', Joni Mitchell's live record, and it has been blowing my mind. The power of her performance. That and Michael Kiwanuka.